316 pages | 126 B/W Illus. Excitable media comprise a class of models for a wide range of physical, chemical, and biological systems that exhibit spontaneous formation of spatial patterns. 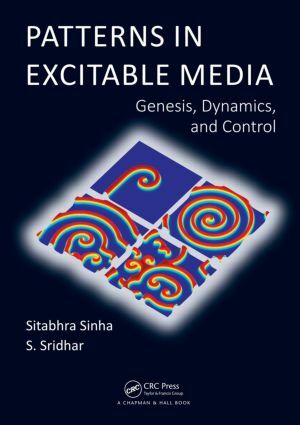 Patterns in Excitable Media: Genesis, Dynamics, and Control explores several aspects of the dynamics of such patterns—in particular their evolution upon interaction with structural and functional heterogeneities in the system. The book provides readers with an introduction to recent developments in the interdisciplinary field of dynamics and control of patterns in nonlinear biological systems described by excitable media models. It also discusses low-amplitude control schemes for eliminating such patterns from an excitable medium which has direct clinical relevance in view of the close connection to life-threatening cardiac arrhythmia. "… a good introduction for undergraduates and early graduate students to the dynamic formation of patterns in reaction–diffusion systems. … I would recommend Patterns in Excitable Media as supplemental material for multidisciplinary courses that deal with nonlinear dynamics, chaos, computational physics, and applied math." Sitabhra Sinha is a professor of theoretical physics at the Institute of Mathematical Sciences in Chennai and an adjunct faculty of the National Institute of Advanced Studies in Bangalore, India. He received his PhD from the Indian Statistical Institute at Calcutta. Dr. Sinha’s subsequent research has focused on understanding complex systems using techniques from statistical physics and nonlinear dynamics. His current research interests include modelling cardiac arrhythmia, the mesoscopic organization of complex networks, computational neuroscience of the nematode C. elegans, and the application of statistical physics for understanding the emergence of universal distributions in socio-economic phenomena. S. Sridhar is a postdoctoral researcher in the Department of Chemistry at Brandeis University in Massachusetts, USA. He obtained a PhD in theoretical physics from the University of Madras, India. His doctoral research was carried out at the Institute of Mathematical Sciences in Chennai and involved investigating the nonlinear dynamics of patterns in biological systems and developing control schemes for spatially extended chaos having potential medical applications.